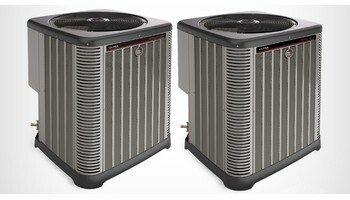 The Ruud Ultra Series™ High Efficiency model, for example, has a SEER of 18.00, among the highest available. It’s significantly higher than today’s standard models, many of which carry SEER’s of at least 13. High SEER models are generally more expensive, but can easily make up the difference by reducing your home energy bills over the long run. The compressor is the heart of a condensing unit. On a hot day, it works long and hard. Ruud installs the highly advanced scroll compressor in every Ruud condensing unit we produce. Scroll Compressors are recognized by the industry as the leader in reliability, efficiency and quiet operation. More than 100 years ago, Edwin Ruud, a Norwegian mechanical engineer, came to America and developed the first successful automatic water heater. That early success marked the beginning of a tradition of innovation and value that led to the introduction of RUUD heating and air conditioning equipment in the 1950s. Since then, the RUUD has grown into one of North America's largest manufacturers of quality heating, cooling and water heating products for residential and light commercial use. RUUD operates manufacturing facilities employing highly trained workers and state-of-the-art equipment. Over the years, the product lines have expanded, changed, and improved significantly as new design techniques and better manufacturing technologies have become available. Ruud is proud of the quality that goes into each one of our products - which is why we back them with up to a ten-year limited parts warranty. we want you to enjoy the benefits of owning a worry-free piece of equipment. As good as your new Ruud equipment is, however, problems can sometimes occur. With our Protection Plus extended Service agreement program, you can protect yourself from unexpected, unbudgeted repairs after the limited warranty expires. Protection Plus allows you to extend the limited warranty on your Ruud equipment up to 10 years, depending on which plan you choose. Coverage begins on the expiration date of your Ruud limited warranty.